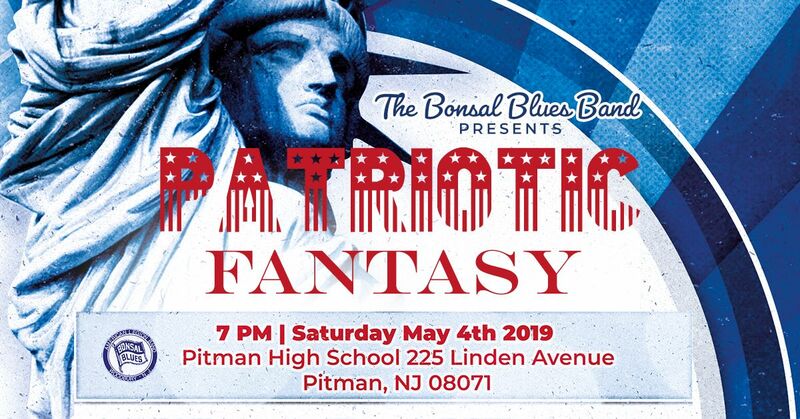 The Bonsal Blues Bands presents “Patriotic Fantasy” annual spring concert. The Bonsal Blues is a family-oriented community band located in Woodbury, NJ. We consist of a concert band, a marching band and colorguard, and an 18-piece swing band. Since 1948, the Bonsal Blues has performed in festivals in Baltimore, Toronto and the Netherlands among other places. We have also played at Disney World and Hershey Park. Many of you have probably seen us in one of the many parades and concerts that we perform yearly in the South Jersey area. The Bonsal Blues Concert Band rehearses every Monday night from 8:00-10:00 p.m. at the American Legion Post 133 hall at 1018 Washington Ave, Woodbury, NJ. We play all types of music for many types of events and venues; parades, festivals, family picnics, senior living homes & communities, churches, and more! Contact our Business Manager, George Wiese.